As a result of the emerging awareness that what you eat largely determines your health, the concept of food as medicine is gaining momentum. Dr. Caldwell Esselstyn of the Cleveland Clinic published a study last year in The Journal of Family Practice demonstrating that patients with coronary artery disease eating a whole food plant-based diet had approximately a 30-fold decrease in cardiovascular events (heart attacks, strokes, placement of coronary stents, and heart surgery) when compared to patients treated with conventional strategies. ...A paradigm shift in true health care is on the horizon. Perhaps the single most encouraging recent development, at least in my mind, is that the current president of the American College of Cardiology [now Immediate-Past President], Dr. Kim Williams, embraces fully Esselstyn’s findings and has adopted a whole food plant-based diet himself. In fact, he delivered the keynote address to hundreds of like-minded physicians and researchers from 15 countries attending the International Plant-Based Nutrition Conference in Anaheim, California, earlier this month. Wouldn't it be a laudable goal of the American College of Cardiology to put ourselves out of business within a generation or two? 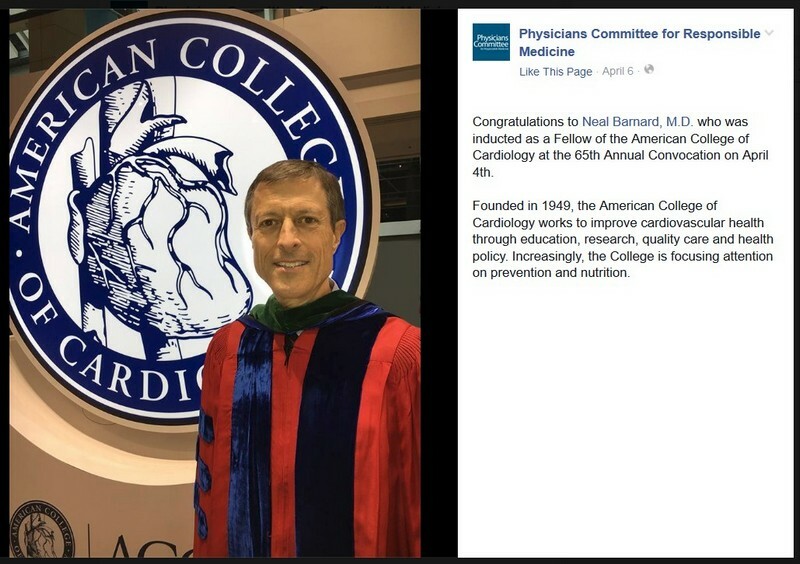 So who arranged Dr. Barnard's American College of Cardiology fellowship presented last week? Presumably the current president of the organization can explain. Unrelated to nutrition science, click here for Dr. Barnard's and his organization's problematic relationship with my father.